Sometimes all you need to do to be productive is to put your thoughts and words into actual paper. That way you are constantly reminded of what you need to do; in addition, you also have a document you can look back on to assess what you could do better next time you do the same task or activity. Notebooks and journals exist for this very reason. Aside from the other mentioned advantages, it also helps relieve stress at the end of a challenging day. Both teachers and students need to be reminded of the lessons and tasks that they need to attend to each day. Thus, having a journal that will allow you to easily input what you need to do will surely help you become more efficient and productive. 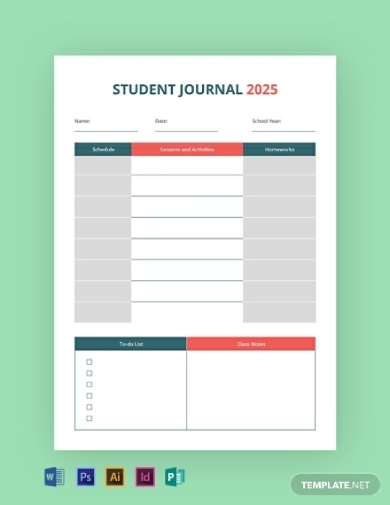 You can use this student educational journal template to keep track of your lessons and other activities; this has a clear layout and design that you can easily customize to suit your preference. Making your own recipe at home means that you eyeball the measurement of each ingredient, but if you want to continue making the dish you need to have a document that records the entire recipe along with proper measurements and procedure. You can easily do that by having a recipe journal that consolidates all the recipes you make to ensure you have a reference should you decide to make it again. 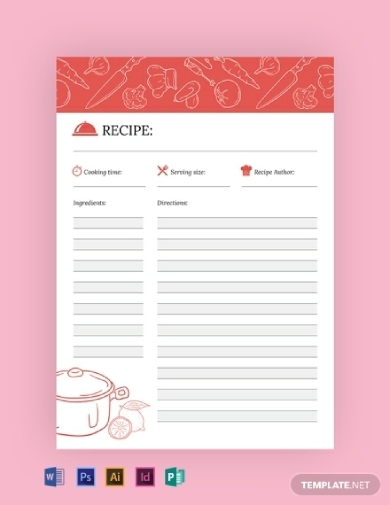 You can download this recipe journal template to clearly list all the necessary details. Brilliant writing ideas should not be wasted, that’s why whenever a good idea pops up it is always better to write it down immediately. You can totally and easily do that with the help of a writer’s journal. In the journal you can list down the possible plot summary, theme, settings, etc. to ensure you have something to easily refer to should you decide to continue writing the story. 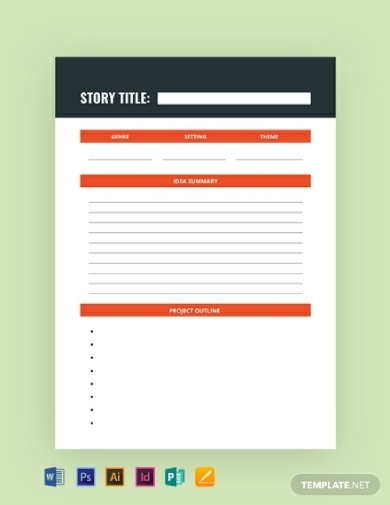 With that, you can download this simple writer journal template for free from this article. Whether you’re attending a music class or trying out an instrument for the first time, you need to take note of all the important lessons regarding music. 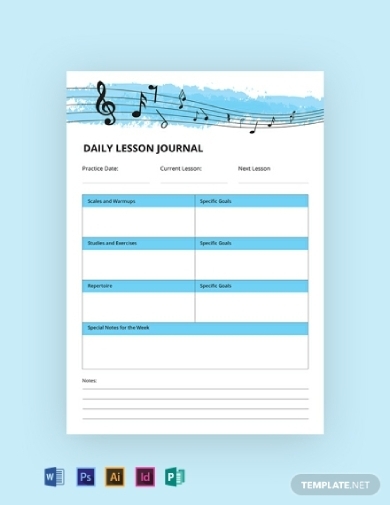 Thus, having a music journal that records the lessons, activities, etc. and tracks your progress will help you achieve your end goal. With that in mind, we have a printable music journal template that you can easily download and edit in Adobe Illustrator, Photoshop and InDesign, and MS Word and Publisher. Making sure you keep track of your progress when you engage in any sport or athletic activities will ensure that you don’t get stuck in a plateau. Having a journal that lists all the activities that you do along with the result you get from them will ensure that you can continue to think of new activities to help you improve further. 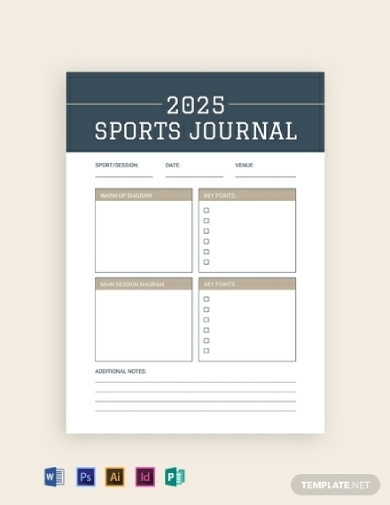 You can download this editable sports journal template to start with your training and fitness journey. The journey to self-growth is never-ending. You need to continuously try new things to discover your inner self. Keeping a journal to document what you’ve done for the day, what practice you tried, how it affected you, and so on helps make sure you have a clear sense of self-awareness. This will also help you become more inspired as you go on from day to day. 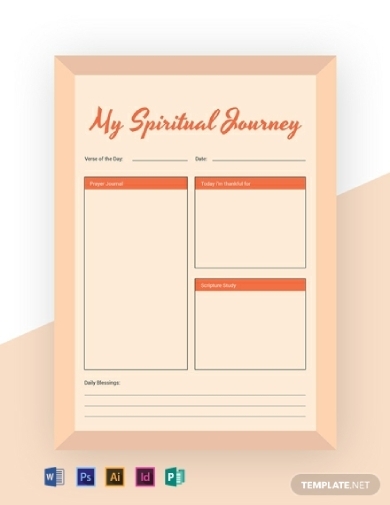 You can use this inspirational journey journal template to document your spiritual journey to self-growth. Having a daily journal can help you assess what you have done for the day, how it helped you, where you currently are with your goals and objective, and so on. It will provide a clear overview of your experiences that will help increase self-awareness and will help you make better decisions in the future. 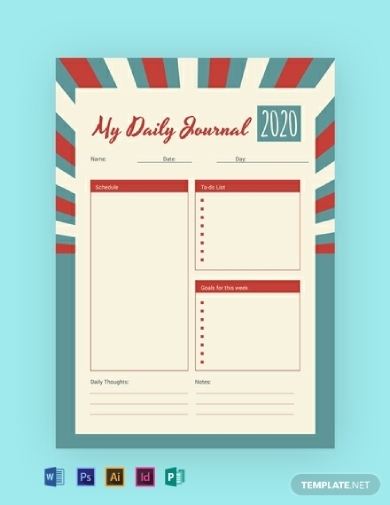 If you are looking for a retro-themed daily journal, you can download this template to incorporate all the elements or aspects that you prefer. Having the chance to travel especially on your own should teach you a lot of things. It is an eye-opening experience that will definitely change your outlook on the world. To have a reminder of what you have learned on your travel, you can list down all the experiences and lessons you have learned and understood. 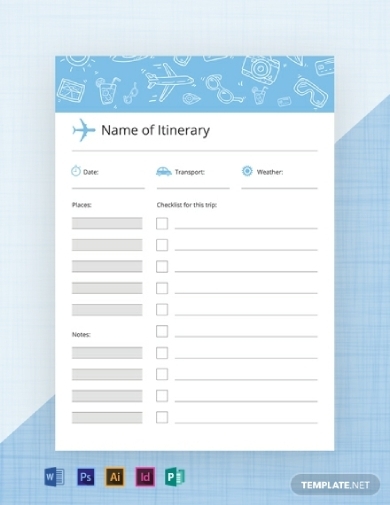 You can also list down all the tips and tricks that you can share with others who are about to travel to the places you’ve visited. 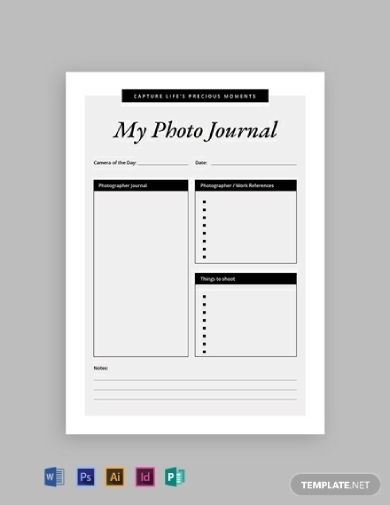 Download this travel journal template to get an artistic and well-structured journal. There is a need for continuous improvement in any job or hobby, that’s why it is always better to do activities that will help you hone your skill for the better. In relation to this, you can use a photography journal to keep track of your progress and activities that you need to accomplish as a photographer. This template has a clear layout that will allow you to input the details that you wish to incorporate; download this template from this article for free. Junior year is when students start to have laboratory experiments. To make sure they know how to properly take care of the lab and how to properly conduct the experiments, a guide should be given to them. 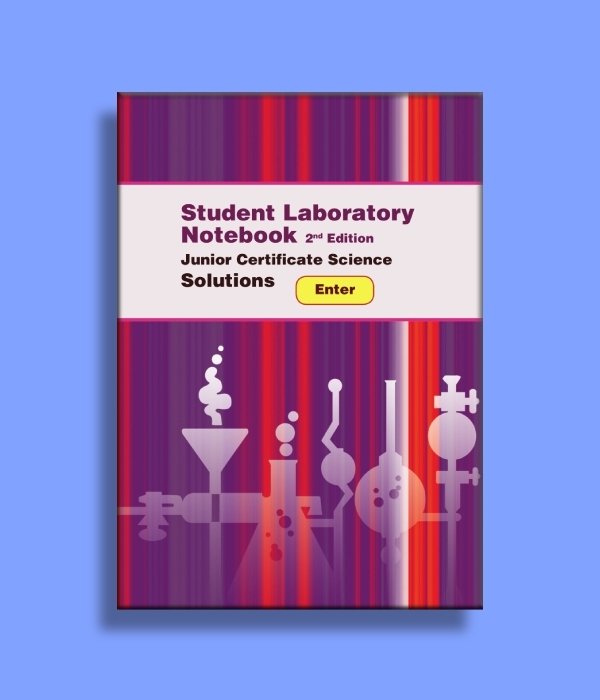 This student laboratory notebook contains all the details regarding the student laboratory. It helps the student become aware of what he or she needs to do and can’t do inside the school laboratory. Almost every student dreads the time for math lessons. It has become a subject that students hate because of the complexity of the lessons, but all of that can be changed when there is a document that can help them better understand each lesson under the subject. 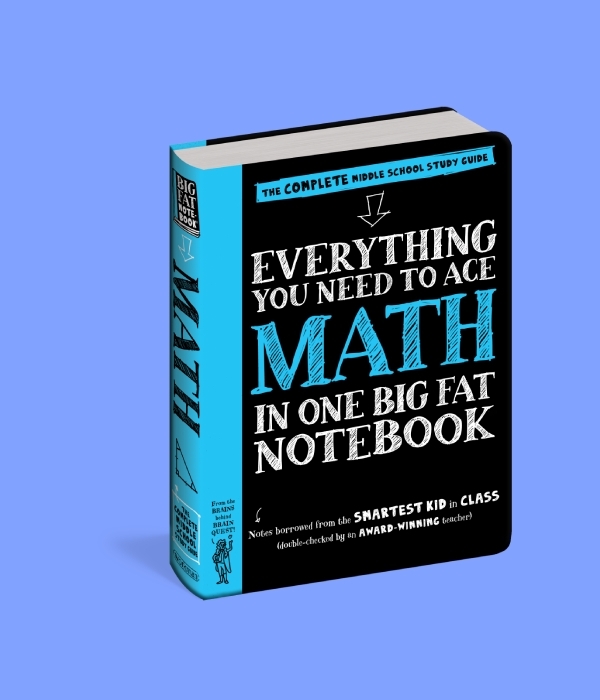 This math notebook aims to help students ace the subject with simplified explanations on difficult topics and will serve as their reference point as they study for quizzes and tests.